Available in four fresh scents (Aquae, Citrus, Flora and Celebration) as well as in Scentless. And of course you can buy them by the bottle – but the travel packs hit our heart with an arrow thru and thru! Great gift ideas too: calorie free Valentine treats for travelers, colorful additions for the Easter basket and if you must wait, perky stocking stuffers! 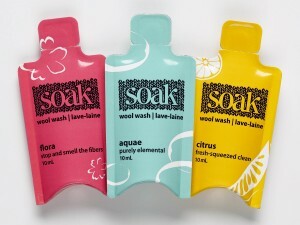 Soak, a no-rinse, biodegradable solution for all your hand wash-only delicates. It’s Tango Diva tried and true, we love it.